HONG KONG, July 11, 2018 /PRNewswire/ — Honor, a leading smartphone e-brand, today shared figures that show Honor’s growth globally in the first half of 2018. Chief among them, a remarkable 150% increase year-on-year in international sales volume outside of China. 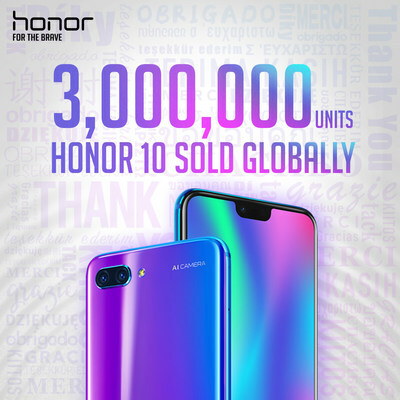 This continued advancement represents significant progress for Honor towards its goal to be among the top three mobile brands globally in the next five years. France, where the Honor 10 was the second bestselling smartphone online and sixth ranked in retail sales overall in the EUR300-400 price range in May. Russia, where the Honor 10 is the bestselling smartphone in the RUB25,000-30,000 price range and is ranked in the top 5 smartphones in the GfK Hitlist.